I forgot to mention I saw "Wanted" on Monday. Before you start looking to see a movie this weekend, I want to throw in with Randy here. The James MacAvoy/ Angelina Jolie/ Morgan Freeman movie "Wanted" isn't terribly good. I don't know why. It seemed to have lots of plot elements I should have enjoyed and the idea behind the movie sort of had potential. But (1) it sort of ripped off Star Wars in some ways from a plot perspective, and (2) it refused to actually explore the space set up by the movie, which actually seemed interesting. Also, the title "Wanted" had nothing to do with anything. The movie seemed as if it had potential to be an over-the-top dark comedy of sorts, but that, flat out, didn't happen. Instead they went the action movie route towards a terribly unsatisfactory denouement. I also keep hearing how great Angelina Jolie was in "28 Days", but this is like the third movie I've seen her in, and I don't get it. She seemed as if she was barely registering in the movie, and mistakes "looking as if you're thinking about being somewhere else" for mysterious. I'm also one of the rare guys you'll find who doesn't find Joile attractive. (A) I look at her and see Joe Buck in makeup, and (b) she's gotten so scrawny by this movie, its sort of tough to take her seriously as someone who could take you in a fight. MacAvoy is okay. No problem there. The material just wasn't ready to support what he should have been doing in the role. There's a few moments of slow-mo brilliance that lets you know what he should have been doing for the duration of the movie and who the character COULD have been. The movie spends the first 2/3rds setting up a world, which is really too long. About, seriously, five minutes showing that world in action, and then the last 1/3rd taking the world apart. It's just a terribly clunky way to balance a story, and sort of makes you feel that the action taken to get you through the first part so you can get to the second is sort of a waste. Like "Men in Black", the creators are so interested in introducing you to "how things work", there's just not much room for a story. At the end of the day, the movie could have drawn you into the world of super-human assassins and their world of moral ambiguity. I'm reminded of the engrossing environment and characters of "Fight Club", and the unapologetic approach to characters who sneer at mundane work-a-day life. That seems to be the message "Wanted" thinks its offering up, but they sort of forget that (a) killing people is illegal and won't get you very far, and (b) most people don't suddenly find out their anxiety attacks are actually supper powers bubbling to the surface (yeah, that's a spoiler, but if you don't see it coming, woe unto you). Prescribing super powers as the antidote to modern day office work is... a curious solution at best. Oh, and yeah... this is based on Mark "My Ego is Huuuuuuuge" Millar's graphic novel, which I've never read. I have very little idea what these guys are literally saying, but I appreciate the overall message of the video. As I said to Steven, when he sent me the video, What isn't awesome in this video? That said, its not meant for the eyes of our more sensitive viewers, so please view with discretion. For something of an explanation, go here. It seems Jamie has decided to carry on in the grand League of Melbotis tradition with a taste test of her own. Please feel free to drop by and disagree with me. Things that sound like they're going to be a lot more interesting than they wind up being. Is actually: a 1944 light romantic romp with Van Johnson. here. So, today I went to Target to return two items. I'm not a guy who returns things a lot, but as I mentioned yesterday, my copy of the Batman: Gotham Knight movie was a bit jacked up. I also bought a stereo sort of thing at Target a few months ago, and now, of the options (radio, CD, tape, record player) the radio doesn't work. So, anyway, I took both back to Target. The Target lady basically told me: your radio was bought too long ago, so I'll only give you $35 for this item. So I figured 3 out of 4 functions ain't bad and gave up on that. After all, that's a pretty sound policy, and I didn't have my receipt. The Batman movie, however, was another story. I bought it literally yesterday, and already they were sold out at the store. And every location within 10.3 miles. I know this, because the girl at Customer Service printed out a list of where they DID have a copy. "That's, like, $6.00 on gas on a $19.00 movie. I just want my money." So she called her manager. "Sir, this is a copyright issue. We can't just refund your money." "I worked in a record store and I know how computers work. I understand piracy. And I want my money back." "They have it at Capitol Plaza." "I have no reason to GO to Capitol Plaza. I'll just take my money." So she called her super manager. "Sir, it's a copyright issue." "I know. But its your copy of the movie that's messed up. I brought it back within 24 hours. Its not my fault you guys understocked." "We can hold it and maybe call you when we get more copies in." "And will you actually call me?" "No. This is your broken movie. Just give me my money." "I can't do that, it's a copyright issue." "You're saying you don't stand by your own product? I can show you on any DVD player how the disc is messed up." "I didn't copy it. I want the same movie and you're out of stock. How is that my problem?" "We can only exchange opened items for the same item." "You know, Amazon would help me out." "You're giving me absolutely no reason to shop here anymore." "You can call our Customer Service Line." "They'll hear you out and make a decision." And I could just imagine the person I'd be talking to in India or Minneapolis, working from a script, telling me they'd put me in a system, and in 6-8 months they'd call me back to tell me I was stuck with a broken movie. "No. This is ridiculous. I'm not calling some service line." But that's the magic of customer service today, I guess. You get sent to make some phone call you know you will be buried. "Here, let me get you a card for our customer service-"
"I don't want it. I'll just come back some other time and get a new copy." "Let me get you a copy of the card for our-"
"I'm not going to call and disappear into some phone limbo. Absolutely not. This is terrible service." It IS the store's policy, by the way. The DVD companies aren't cutting a major retailer like Target out of the chain. Its just easier to NOT help one customer. We had the same concerns when i worked at a record store in 1997, but we didn't consider it the customer's problem if we didn't have something stocked. We gave them store credit for our inability to have, say, more than one copy of "The very best of Connie Francis". So I DID take the DVD home. I have no idea when or if they'll get in more copies. And what sort of ridiculous policy I can look forward to from the service desk at that point. Anyhow, this is the future of shopping. 1) My ability to outright own a copy of digital media, a la iTunes, for my TV can't come quickly enough. 2) Amazon. I had always pre-ordered my copies of movies through Amazon, but decided that it was a waste of packaging, etc.. as I always wind up seeing the movie at the store for sale for roughly the same price. But from now on, Amazon. They've never once given me lip about returning ANYTHING. 3) Target reps could have cared. They actively chose not to help in any way other than trying to get me to go 10.4 miles away. The store, by the way, was Austin Southpark SuperTarget. The manager's name was "Stan". And don't get me started on the idiots at Circuit City. But here's a hint to Circuit City management: If they can't find the movie called "V for Vendetta" in the alphabetically filed DVD's in under 15 minutes, its time to take a serious look at your hiring policies. I am sorry to report that Randy and the Mysterious M's cat, Baby, has passed away. 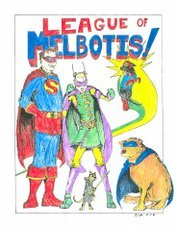 If you've known Randy for a while, followed his various blogs, etc... you will know that Randy loves his cats the way we at League of Melbotis consider the pets to be members of the family. Unfortunately, Baby had been dealt several ailments, and M and Randy had to say good-bye. So, please take a moment today and visit Randy's post. And take a moment today to salute Baby. Well, looks like I'll be needing to buy a new home PC fairly soon. The good folks at Sony Online Entertainment are getting pretty far along with their online multiplayer game set in the world of DC Comics. I believe I am EXACTLY the target market for this game. I read piles of DC Comics, and I'm not averse to games, but I spend my time and money on comics rather than on, say, World of Warcraft. So, I think they can consider this one copy and a membership sold. They're actually working on this game in Austin, which is sort of mind blowing. I've applied there once or twice, but Im not really sure how to shine the Bat Signal on me and say "seriously, I'll work like a maniac on this one." As you know, the new Batman movie is coming to the theaters. I'm pleased as punch, and it seems that early reviews are looking pretty good. Bat-Item #1: I'm in deep yogurt with Jamie. You see, The Dark Knight is being released to theaters on Friday, July 18th. I have bought two tickets to the 11:40pm screening for Thursday, July 17th at the Alamo South. We're headed for Houston on Friday afternoon after Jamie's been to dialysis on Friday morning. As she has to be up at 7:30ish for dialysis on Friday, it seems that she probably won't be going to the movies with me until the wee hours of Thursday. So... I have a spare Bat-ticket if anyone wants to see The Dark Knight next Thursday evening. Just shoot me a bat-mail. Bat-Item #2: If you have a few spare minutes, check out the spoof Michael Bay script for a Batman sequel at The Spill. Totally, positively brilliant. Sadly, it seems folks in the comments section were not clear that this was a bit of a larf at the expense of Mr. Bay. So... yeah. And it seems the site is where Korey, Jamie's former co-worker, is now cooling his heels. Thanks to Shoemaker for sending this link. Bat-Item #3: I'm pinching pennies with generic cereal and soda, but I did go out and pick up "Batman: Gotham Knight". It's DC's latest animated feature film, and its well worth checking out. It's six short films, all loosely interconnected and handled by several different writers and artists. As I told Jamie, I almost found the movie a bit overwhelming. The artistry of the movie is unquestionable. This is excellent talent having a field day with the material. I should probably mention the animation was also in what I'll loosely call the "anime" style, though it vastly surpasses, say... Pokemon, and there are fairly vast differences between US animation and the storytelling techniques of Anime. The Gotham of the film falls somewhere between the "Batman Begins" and the continuity of the comics, including villains and protagonists from the funny book pages (I was thrilled to see Cris Allen show up, and a stand-in for Renee Montoya). Unfortunately, I'm returning the 2-disc set. The second disc of the set was messed up pretty badly and really blew up my DVD player. I wound up having to unplug the player from the wall to reboot it. Bat-Item #4: Grant Morrison's run on Batman has gotten so topsy turvy, I think I'm just going to have to hold out until the end of the Batman RIP storyline before I have anything intelligent to say about it. That said, I'm enjoying it. Bat-Item #5: From what I've read, it doesn't sound like "The Dark Knight" is a movie for little kids. Or even much of a family-fun film. Which is putting the marketing ad-in's in a weird spot. At Target today, I saw the action figures for the new movie (they're pretty good! ), but I kept thinking how weird it was to have toys of an actor so recently passed, and playing a murderous lunatic at that. Throw in the images of Bale's Batman looking back at me from candy wrappers and cereal boxes, and its an odd, odd mix. I guess it speaks to the flexibility and resiliency of the Batman franchise that he can be a smiling face on a kid's toy in one aisle of a store, and he's breaking the bones of thugs in a movie playing at the cinema, and nobody "bats" an eye. Bat-Item #6: The Alamo South is showing the classic Adam West version of Batman at 11:00 AM next Monday through Thursday. I am totally going. And I'm bringing my Bat Shark Repellent. Ilana and Dan 2008 from Vladimir Chaloupka on Vimeo. update: Seems that this post caused some confusion. Dan is a guy who I've been pals with for several years. He lives in Chicago these days, and so I don't often get to see him. Do you generally dislike yourself and others? Then I have a show for you! It's Always Sunny in Philadelphia returns to the FX network on September 18th. Here's the site. Turn down your speakers, work slackers. Oh, go off and watch your quality programming. I know Mad Men returns at the end of the month. I'll watch that, too, but mostly I'll be watching "Sunny".